With back-to-school looming in the not-so-distant future, and 9.4% of children being diagnosed with ADHD each year (source), ADHD in the classroom is an important topic for parents and teachers alike. Teaching kids with ADHD can be extremely challenging, and while parents are eager to discuss ADHD classroom accommodations to ensure their child’s needs are being met throughout the school day so they can thrive and learn, teachers need concrete ADHD strategies at their disposal to help them understand the struggles their students face, and how they can best support them. If you’re the parent or teacher of a child who struggles with inattention, hyperactivity, and/or impulsivity, this collection of ADHD strategies is designed to make ADHD in the classroom (and beyond) less daunting. Before we dive into strategies for teaching kids with ADHD, there are certain things parents wish all educators knew about ADHD in the classroom. Don’t assume it’s ADHD. Most young kids struggle with some of the common characteristics of ADHD, like sitting still for long periods of time, following directions, and exercising self-control, but it isn’t until these behaviors start to significantly impair a child’s school and home life that an ADHD is pursued, and a child must display a certain number of symptoms for a specified period of time before a diagnosis can be made. While you may suspect one or more of the children in your classroom have (undiagnosed) ADHD, remember that the symptoms you are witnessing may have nothing to do with ADHD, and could be the result of something completely different, such as an anxiety disorder or other learning disability. ADHD is NOT caused by bad parenting. If a child struggles to sit still, follow directions, and keep her hands to herself due to an ADHD diagnosis, please remember that her behavior has nothing to do with a lack of discipline at home. ADHD is a neurological disorder that causes daily struggles for children and their caregivers, and suggesting a child’s behavior is a direct result of poor parenting practices is both callous and misinformed. Girls present ADHD symptoms differently than boys. While some of the online literature about ADHD suggests that boys are up to 3 times more likely to be diagnosed with ADHD than girls, these statistics could merely be due to the fact that ADHD presents differently between both genders. While boys may be more prone to the hyperactive/impulsive symptoms of ADHD, girls tend to struggle more with inattentiveness. And since the symptoms of ADHD in girls are often more subtle, they often go undiagnosed, which can have long-term impacts on a girl’s self-esteem. ADHD can cause fine motor difficulties. Children with ADHD often struggle with their fine motor skills – the ability to control the small movements in one’s hands and fingers – which can make handwriting extra challenging. This can cause difficulties at school, particularly when it comes to writing down and completing assignments, and ADHD classroom accommodations may be required. Kids with ADHD need positive feedback. When a child struggles to pay attention, has difficulty following directions, speaks out of turn, and lacks appropriate self-control, they’re often subject to a lot of negative feedback throughout the day, which can be detrimental to their self-esteem. It’s especially important for these children to receive praise wherever possible. Organization is particularly hard for kids with ADHD. Kids with ADHD struggle with organization, which can often get them into trouble, especially at school. They find it difficult to plan ahead and prioritize, and often forget to complete tasks in a timely manner. One of the best ways to help a child overcome this challenge is to put organization systems in place, and to enforce strict maintenance of these systems over time. ADHD in the classroom may sound daunting to some teachers, but with adequate knowledge, planning, preparation, and perseverance, teaching kids with ADHD can actually be quite rewarding. 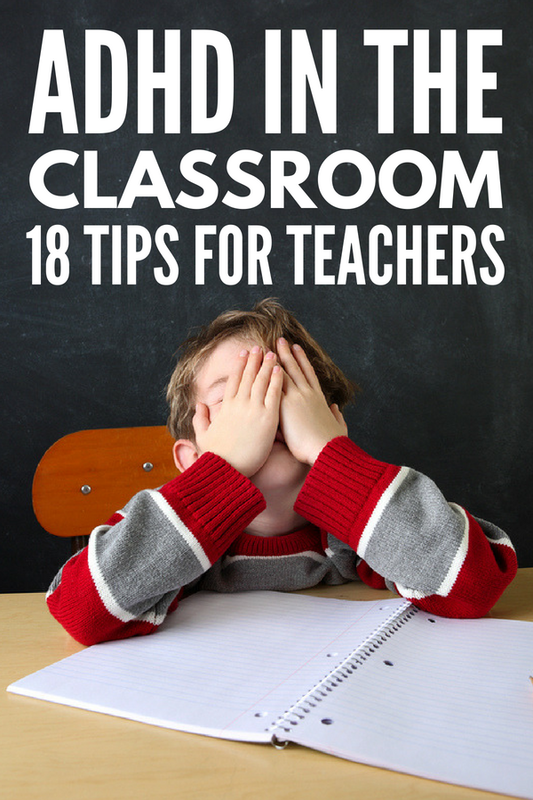 Below are ADHD classroom accommodations and tips for teaching kids with ADHD to help get you started. Seating. When devising seating plans for your classroom, make sure the children who struggle to focus and pay attention are seated in an area that is free of distractions. Avoid seating them next to a window or close to the classroom door, and position them as close to the front of the room as possible so you can keep on eye on them, offer extra help, and intervene as needed. Break assignments and tests down. Kids with ADHD often struggle to complete classroom assignments because they lack the ability to break them down into smaller, more manageable tasks. Take the time to write out what needs to be done (and when) so these students can visually see what’s expected of them, and then work together to ensure each step is completed along the way. This will require more upfront help on your part, but your students will eventually learn how to break large assignments into bite-sized pieces that are less overwhelming. Teach and supervise organization efforts. As mentioned earlier, kids with ADHD struggle with organization, which can be very problematic from a school point of view. Taking the time to teach these children organization strategies, and regularly supervising these efforts to ensure they are maintained, will help keep them accountable and on track throughout the school year, and set them up for long-term academic success. Allow extra breaks. If one or more of your students struggles to pay attention for long periods of time, identify appropriate ways they can take breaks throughout the day so they can regroup when they are feeling frustrated, and provide regular reminders when you notice their concentration waning. This will help ward off aggressive explosions during activities they find challenging, and over time they will learn how to recognize when they need a break and act accordingly. Establish warning signals. If you have a student who struggles with inattention, impulsivity, and/or self-control as a result of an ADHD diagnosis, consider developing a warning signal you can use to provide nonverbal cues to the child. This will help you prompt him or her to re-focus and/or take a break without explicitly calling the child out in front of his or her peers. For example, you could wave your hand, pull your ear lobe, or tap your foot 3 times as a signal to the child. Use visual schedules. A visual schedule is a visual representation of a sequence of events that is created using pictures, icons, words, etc. Most classrooms use a basic schedule outlining the different activities students will be participating in throughout the day, but some children benefit from a more detailed outline of exactly what will happen from one moment to the next so they know what is expected of them and can plan ahead. CLICK HERE for 25 visual schedule ideas that work both at school and in the home. Prioritize exercise. Children who struggle with hyperactivity need regular exercise throughout the day to help them shed themselves of excess energy. Make sure these children are active during recess and gym class, assign them classroom jobs like taking notes to the office and handing out papers to their classmates, and find ways they can take active breaks throughout the day (i.e. walking up and down the hallway when they are having trouble focusing). Use positive reinforcement. Reinforcement is a fabulous technique to use when a child is demonstrating behavioral problems, and while both positive and negative forms of reinforcement can help teach children self-control, research tends to suggest that positive reinforcement – the act of rewarding a child when he or she completes a desired behavior as a means of increasing the likelihood he or she will repeat the behavior again – is the most effective. Sticker charts are a simple, yet effective, form of positive reinforcement that can be extremely motivating for kids, and I love this Dry Erase Reward Chart as you can easily customize it for an individual child. Be clear and concise when giving directions. If one or more of your students struggles to focus and you consistently find them dawdling when you ask them to do something, make sure you have their full attention when giving directions. Remove distractions, get down to their level, look them in the eye when speaking, and ask them to repeat your directions back to you to ensure they heard you correctly. Remember to keep directions short and sweet, and to break them down into manageable tasks that won’t cause feelings of overwhelm. By keeping your requests as specific as possible and limiting the number of things you’re asking a child to do at once, you’re setting him or her up for success. Use praise. As I mentioned earlier, children who have problems sitting still, struggle to pay attention, and lack self-control receive a lot of negative feedback throughout the day. Teachers and parents spend a lot of time telling these kids about all of the things they’re doing wrong, and while this isn’t always done deliberately, it can have a huge impact on a child’s feelings of self-worth. Offer praise wherever possible, and make it a point to highlight one (or more) things these children do RIGHT each day. Remember that your students ultimately want to please you in everything they do, and when you take the time to recognize their efforts – even when they don’t turn out the way they had hoped – it can have such a positive impact on their self-esteem. Ignore the small stuff. All teachers want their students to be on their best behavior 100% of the time, but this isn’t necessarily a realistic expectation, especially if you have children with developmental challenges and delays like ADHD, autism, and sensory processing disorder in your classroom. Focus on the abilities of each of your students and go from there. Stop sweating the small, inconsequential stuff, and focus on the big things instead. Remain calm. When it comes to teaching a child with ADHD, staying calm won’t always be easy, but it’s extremely important that you remain in control of your emotions. When you feel yourself becoming frustrated, refrain from reacting, count to 10, and breathe. Remember that the child in question isn’t deliberating GIVING you a hard time, but is HAVING a hard time and doesn’t know how to cope. Be a positive role model and teach him or her appropriate ways to deal with frustration. A wise person once said, ‘if a child can’t learn the way we teach, maybe we should teach the way they learn’. I love this quote because it reminds me that children with delays and difficulties don’t need to be FIXED. They just need people who believe in them and who are willing to go the extra mile to find ways to turn their challenges into opportunities. I hope this collection of ADHD strategies will make ADHD in the classroom less daunting for you. If you found these ADHD in the classroom tips and ideas helpful, please share this post on Pinterest! And if you’re looking for more tips to help kids with developmental challenges and delays, please follow our Autism and SPD board where we share all kinds of helpful ideas we find each day!